It's no secret that I'm a HUGE fan of It Cosmetics! From the first time I tried Bye Bye Under Eye (which I've mentioned here and here and plan to do a solo post on it because it's THAT GOOD), I felt an instant connection and immediately wanted to try more of their amazing products! I have since tried quite a few and I swear I have yet to meet a product of theirs that I don't LOVE! One thing that It Cosmetics does so well is help us create a flawless complexion with their wonderful array of products. Today, I'm highlighting two that are my everyday go-to products for creating a gorgeous complexion without reaching for foundation! You see, I think foundation is wonderful, however, I like to save it for special occasions. For everyday, I much prefer a great CC Cream and finishing powder! I've been loving CC Creams lately and have certainly found a few favorites. It Cosmetics took CC Creams to a whole other level by infusing theirs with anti-aging properties as well as providing major SPF action! You know I love my multi-tasking products right? I typically have very blotchy, uneven skin, so I definitely rely on my beauty products to help rectify this not so pretty situation! This CC Cream is amazefest dot com! Wow, it really evens out my complexion without feeling heavy on my skin. It feels like I'm just wearing moisturizer but with many more benefits! I love that it has anti-aging properties and most important, especially this time of year, it has SPF 50! Now I never have to worry about forgetting that! Once I've applied the CC Cream, I top it off with It Cosmetics Bye Bye Pores HD Finishing Powder! This stuff does WONDERS for my shiny complexion! It delivers a face-perfecting airbrush effect while absorbing oil and shine essentially blurring away the look of pores without settling into the lines and wrinkles. 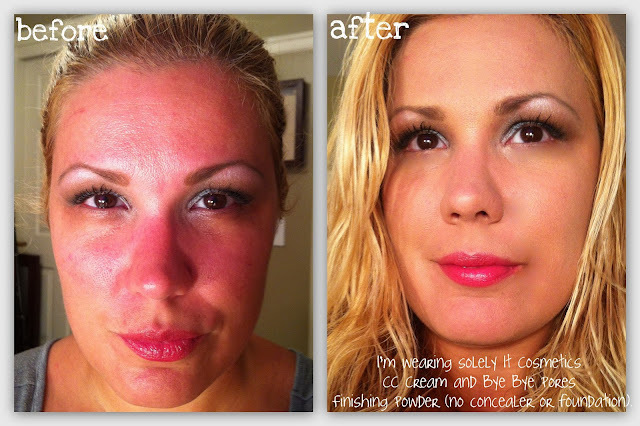 Seriously, it's revolutionary and a perfect compliment to the CC Cream! Check out my before/after and you'll see for yourself just how amazing and powerful these two products are! So now you can get a better understanding as to why I'm so in love with this line. Their products WORK... PERIOD! So lets chat! Have you tried any of these products? What is your go-to product from It Cosmetics? If you don't already own products from this line, which are you most interested in trying? Labels: airbrush cosmetics, gorgeous complexion, it cosmetics, it cosmetics bye bye hd finishing powder, It cosmetics cc cream, no more pores! Makeup is an amazing thing! This CC cream looks fantastic! Oh wow..that does really look amazing! I need to try that out!! amazing make up..these products are fantastic..
wow what a difference it makes. This product looks amazing. thanks for sharing. WOW!!! That is amazing!! I definitely need to get some of that!! Thanks for the review!